After hurricane Sandy, my sister and I temporarily lived in midtown, which gave us a great opportunity to explore the neighborhood and try out new restaurants. We were craving Mexican food one weekend, and ventured over to El Centro for brunch. So glad we did! The service was amazing, the manager took our order and was so friendly and attentive throughout the meal. The food was terrific as well, and the prices very reasonable (many brunch items were $10 or $11). Very colorful and festive restaurant. Complimentary chips and salsa ranchera. The chips are served hot and just fried. They are accompanied by the best salsa ever. I kept raving to the manager about how great the salsa was, and he told me it's made in-house! The ingredients are slow roasted tomatoes, vegetable stock, cilantro (I'm not a fan of cilantro, but luckily you can barely taste it in the salsa), salt, pepper, onions, jalapeño, serrano chile. All this makes for one outstanding salsa with a kick to it. Chicken Chilaquiles, $11: crispy corn tortillas, fried eggs, salsa, chihuahua cheese, crema. So much flavor! Crispy tortillas and a nice slight spiciness to the dish. 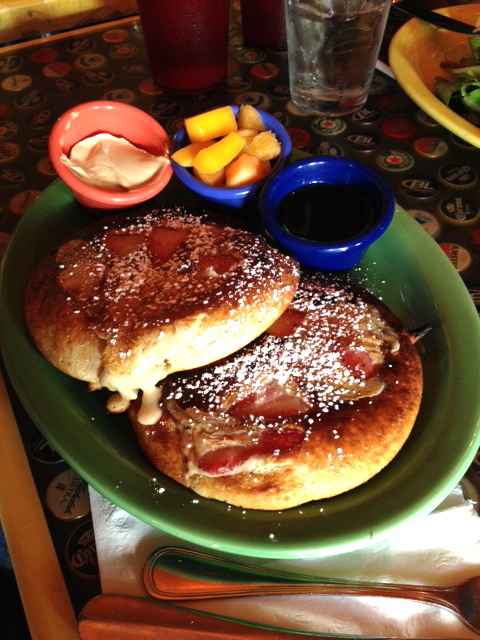 Strawberry Pancakes, $10: Homemade buttermilk pancakes with fresh fruit and creme fraiche. I was doubtful when my friend said she wanted to order pancakes. How could pancakes possibly be good at a Mexican restaurant? Surprisingly they were pretty amazing! Very fluffy and lots of fresh strawberries in each pancake.